Click here to display a few tips for searching the knowledge base. Use correct spelling for more accurate results. Use the most relevant words. Common words like "the" or "and" will be ignored. Words with less than 3 alpha-numeric characters are always ignored. Not finding what you're looking for? Click here to display a list of advanced tips for searching. By placing quotation marks around a set of words, you are telling the search tool to consider the exact words in that exact order without any change. Attaching a plus sign (+) immediately before a word indicates that you only want pages that contain this word to appear in your results. The plus sign should appear immediately before the word (without any space between the plus and the keyword). Click here to display some examples of using the search for optimal results. To get better search results, try using quotes, plus signs and minus signs to modify your search. When you search the knowledge base, by default, it tries to find any article with the any of the words you specified, excluding common words like "getting." This means that if you search for getting started guide, the search will return articles with the word "started" and articles with the word "guide." This includes articles that only have the word "started" and articles that only have the word "guide" but not necessarily both "starting" and "guide." Example Search Term: "getting started"
If you want an article with the words "getting started" next to each other, you should put quotes around it like this: "getting started"
This will only find articles with the words "getting started" next to each other. Even though "getting" is considered a common word, when placed in quotes, it is included as part of the query. But what if you want to find articles with both the words "started" and "guide" but not necessarily next to each other. There is a way to do that. Simply put a plus sign in front of the required words like +started +guide and only articles with both words "starting" and "guide" will show up in the results. The word "getting" is ignored since it is a common word. You can also exclude words by using a minus sign in front of the word you want to exclude. In this example, you can put -guide to omit any results with the word "guide" in it. The word "getting" is automatically excluded because it is a common word. After selecting a category, you may either select a related subcategory, or select articles directly associated with the top level category you selected. An article may have more than one parent category, allowing you to search broader topics as you select categories further to the left from the article title in the breadcrumbs. 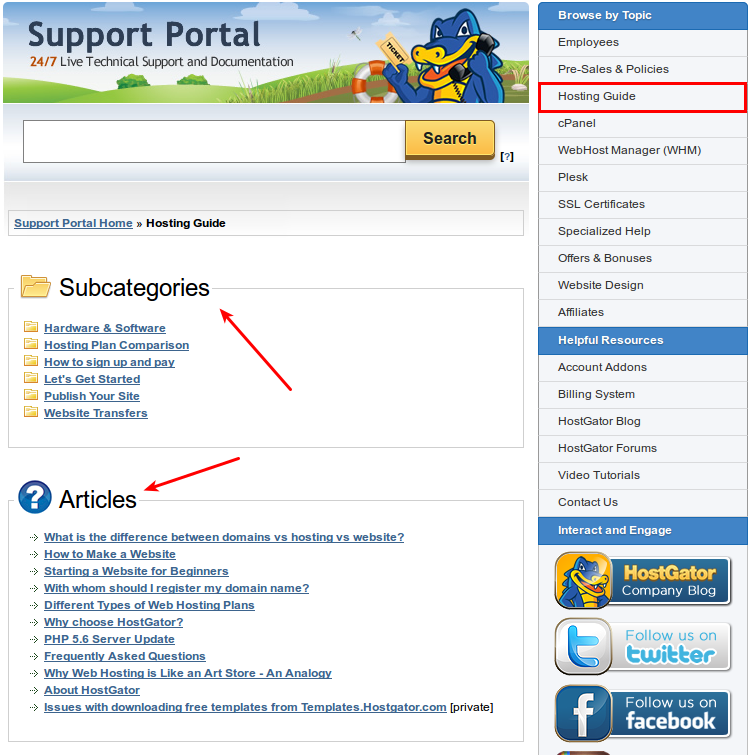 The Helpful Resources section of our support portal provides a list of links to forms for purchasing account addons, a link to your billing portal, our blog, forums where you can get personalized help and responses to any questions you may have, video tutorials, and even assistance with contacting us directly. If you have questions or problems specific to your account, or if you need more assistance than the knowledge base can offer, please contact us via phone or live chat for immediate help.